T-Mobile is planning on starting a new pre-paid wireless service called GoSmart Mobile. The website for the service is now live and reveals pricing as low as $30 for unlimited talk and text. With the $35 a month service you get unlimited talk and text with unlimited 2G browsing which the website calls an "appropriate" speed for browsing, email and social networking. 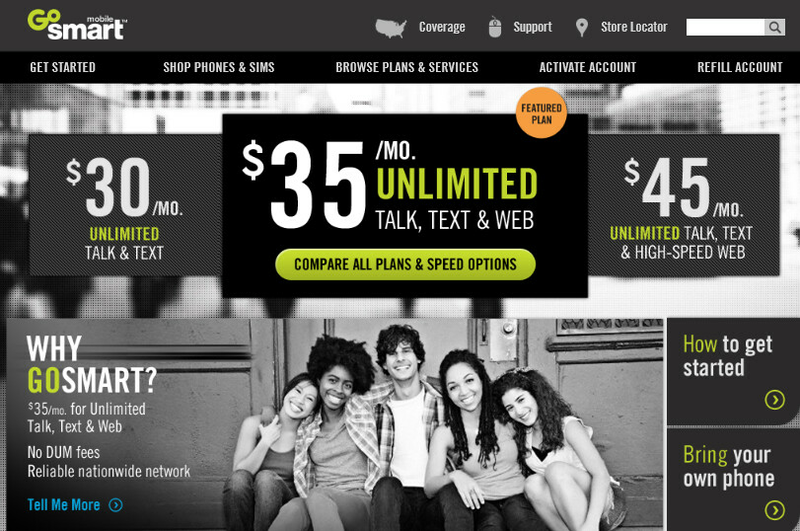 The $45 a month plan gives you unlimited talk, unlimited text and unlimited web. The latter includes 5GB of what is being called high-speed internet, but is in reality just 3G speeds. Go over that cap and you're throttled down to 2G. The only phone shown on the website is the Alcatel OT 838 for $69. The device has a dedicated Facebook button and a 2MP camera with video capture. A 2.4 inch screen and a physical QWERTY are some of the features of the device. Of course, you can bring your own phone to the carrier although BlackBerry units and micro-SIM devices will run with limited functionality. A SIM card kit is available for $8 if needed. We have no details as to when the service will open for business, but we're sure that T-Mobile will give us a heads-up and we will pass that along to you. No thanks necessary, just doin' our job! $30 for unlimited talk and text is actually the best I have ever seen. Lets hope this works out. Why do you LOL prepaid? I used to pay Sprint $120 a month for horrid speed and spotty coverage but it was unlimited. I then switched to Verizon where I paid $104 a month for great speed(LTE) and great coverage except for in my house and was satisfied with everything but the price. Now I am on Straight Talk Bring Your Own Device plan and pay $49 after taxes for great coverage(at&t sim) and decent speeds. I bought a Nexus 4 at $380 after taxes. A while back I did the math between what I paid at VZW and the difference it would make using ST and paying full price for a phone against paying a subsidized price and the contract price. The difference was HUGE! Something like 1600 if I upgraded phones every 2 years and $900 if I upgraded every year. To me it's a no brainer. No contract, unlimited minutes, unlimited textand unlimited data for $45 a month. All I have to do is buy a phone at full price. Just curious, why the Lol at prepaid? Do you believe post paid accounts offers a better value? Because as of today, I have both, post and prepaid accounts, and I don't see any value in retaining Verizon account. T-Mobile's clearly getting ready for MetroPCS coming on board and is likely doing this early to keep the defection rate to a minimum. I'm getting an N4 soon, so I won't need 4G, but in the 518 area code T-mobile looks a little spotty, and I could find no 4G around. I hope it improves, we need more competition. Thank you anyway!!!! Is always good to have an inside source, you know to get a jump on things.